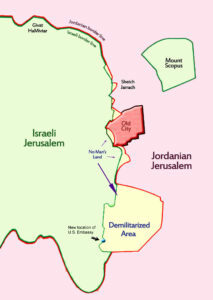 Map of Jerusalem armistice lines between 1949 and 1967. Created by Tamar Hayardeni under Creative Commons license, modified by CAMERA. 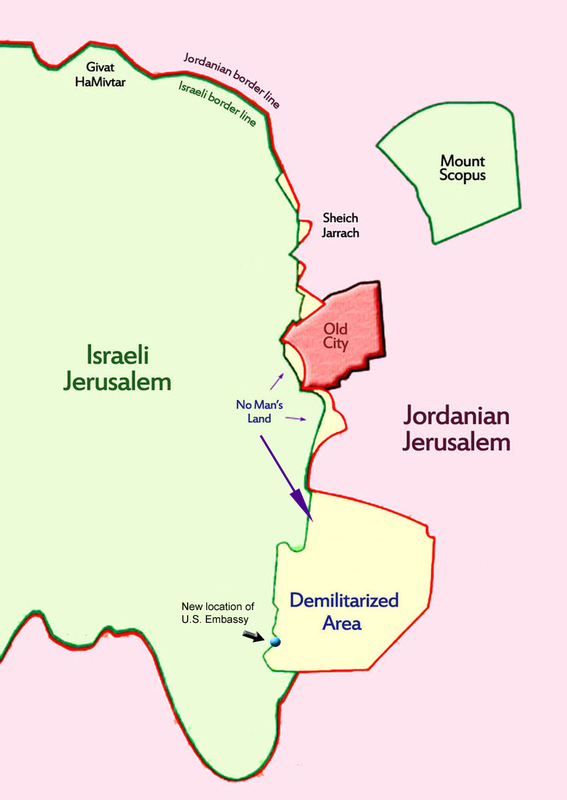 In fact, the embassy compound sits partly in so-called western Jerusalem — the section of the city that has been under Israeli sovereignty since 1949 — and partially in a demilitarized zone that rested between what was Israeli Jerusalem and the section of the city occupied by Jordan. The embassy building crosses into a portion of No Man’s Land that, according to an agreement between Israel and Jordan shortly after the two sides signed their 1949 armistice agreement, was designated for use by the Jewish state. The embassy is partly in predominantly Jewish West Jerusalem and partly in a gray area between the west and predominantly Arab eastern section of the city. The “predominantly Arab” section of the city is roughly 60 percent Arab and 40 percent Jewish.